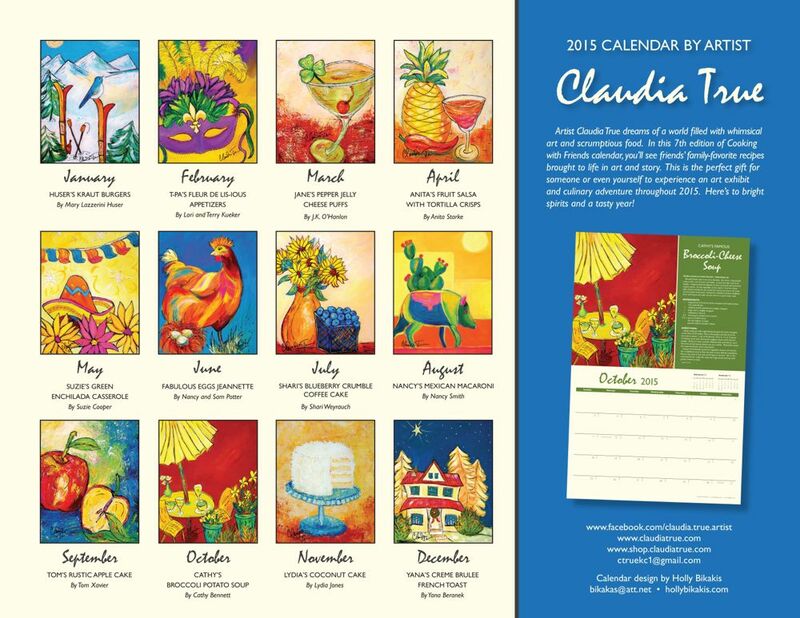 Each month features a friend's family-favorite recipe brought to life in story and a painting by Claudia. 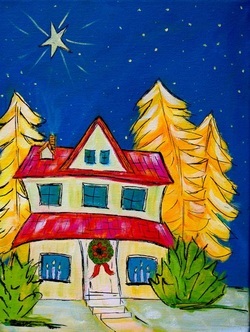 A perfect gift to yourself or someone to experience an art exhibit and culinary adventure throughout 2015!! All calendar paintings are shown below with a bit of their story. ﻿"Mexican Peppers" - Nancy Burchett shared her Mom's recipe for Mexican Fudge. Now doesn't that sound intriguing?? It's a great cheesy/salsa-y appetizer that's easy to make and enjoyed by all. Our calendar has a 13 month layout - this will be on the page for January 2016!! Nancy is a sales rep and demo chef for Dacor Appliances. ﻿"Blueberry Crumble Coffee Cake" - Shari Weyrauch shared this recipe which is a perfect summer treat when blueberries are at their peak, or just anytime!! Shari is owner/baker at Smart Cookies Bakery in Overland Park, Ks. She'll make treats for your special occasions - and now you can bake one of her specialties. We're honored to have one of her recipes! 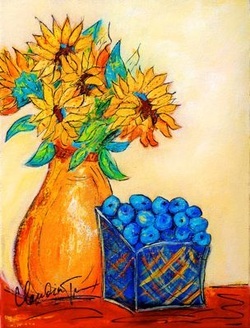 "Fruit Salsa" - My friend Anita Starke has some very innovative recipes! She's an interior designer, and she's just as creative in the kitchen as she is decorating. This is a refreshing version of salsa using fruit, and she includes a recipe for cinnamon sugar tortillas for dipping. The tortillas sound like those amazing churros!! Perfect anytime - and would be a fun addition to an Easter Brunch! This is April's recipe. 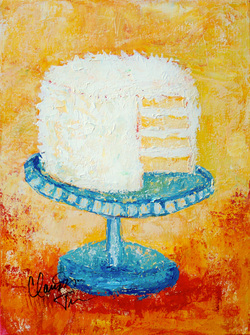 ﻿"Three Day Coconut Cake" - this makes excited about Thanksgiving!! Lydia Jones shared her family recipe for this special cake which is served on an heirloom cake platter. She originally had this when young and visiting her Dad's family in Monroe, La for Thanksgiving. She shares special memories of those family times together. 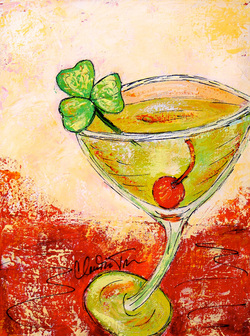 ﻿"Emerald Cocktail" - an Irish variation of the Manhattan from J.K. O'Hanlon who loves celebrating St Patrick's Day. She also has Polish ancestors and recognizes St Joseph's Day, using lots of red in the festivities. Cocktail recipe is in the calendar (March of course!) - plus one for Pepper Jelly Cheese Puffs, using both red and green pepper jelly. I'm ready to celebrate! Jane has lots more cocktail and appetizer recipes in her book 12 Happy Hours - check it out at Thirsty Jane's website. ﻿"Ski Break with Pals" - Yes, this goes with a recipe for Kraut Burgers! Well, especially with the story from Mary Lazzerini Huser. 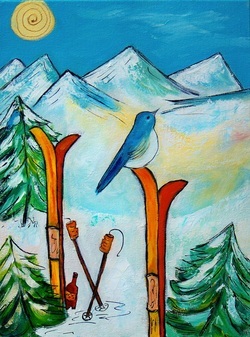 Her husband's family of German descent makes Kraut Burgers to take on ski trips in the California Sierra Nevada Mountains - and they have special memories of bluejays there. 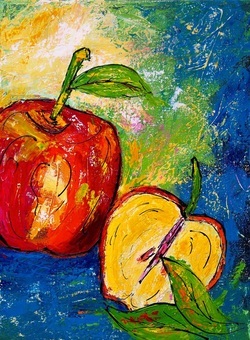 Wonderful story and recipe! We start 2015 with this winter scene and good German food!! This would be a fun dish for Super Bowl parties, too!! "T-Pa's Fleur De Lis-ious Appetizers" - What a delightful name to go with a spicy and delicious Big Easy inspired appetizers!! 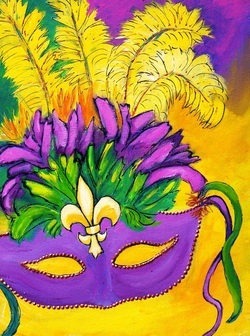 The recipe was shared by our neighbors Lori and Terry Kueker who love Mardi Gras. Terry's grandson calls him T-Pa (or will when he can talk). Isn't that cute!! Look for this recipe in February to help celebrate Mardi Gras!! 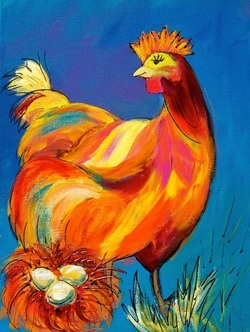 ﻿"Eggs Jeannette" - Who doesn't love deviled eggs? Well - how about "fried" deviled eggs?? This is an adaption of Jacques Pepin's Mother's dishes that was one of his favorites. Oh my does this sound good. Thanks Nancy and Sam Potter for sharing! Enjoy this page in June - good time for those summer picnics with these unique eggs. 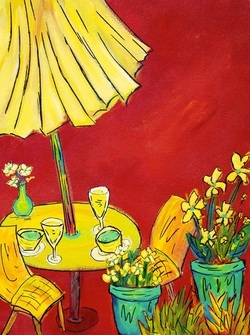 "Lunch with Friends" - Imagine enjoying a delicious bowl of Broccoli & Cheddar Cheese Soup with a friend! You can make your own using a recipe from Cathy Bennett. Her version is healthy - she uses a potato instead of cream to thicken the soup. This is perfect for those crisp October days!! 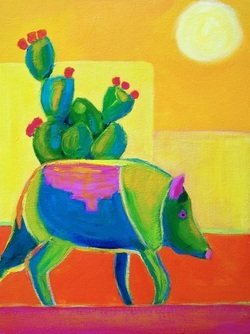 ﻿"Texas Javelina" - the first painting for the calendar! Inspired by a recipe from Nancy Pearson Smith for Mexican Macaroni, which includes pork. She often uses Javelina (a wild "pig") because her husband hunts them in S. Texas. And they both attended Texas A&M University - Kingsville, who's mascot is the Javelina. Nancy's from my first hometown - Bishop, Tx - way south in Texas. Hence the hot blazing sun, especially in August when this is featured. ﻿"Fiesta 2015" - Inspired by a recipe from Suzie Cooper - Green Chili Enchilada Casserole. A delicious and easy recipe that is ready for the oven in ~ 30 minutes. 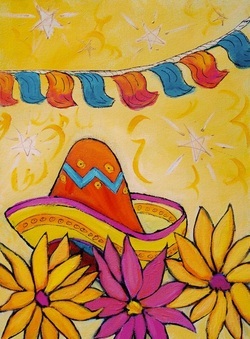 I've seen photos of my crazy friend Suzie partying and wearing a sombrero, so that was another inspiration! This is the May recipe/art to help celebrate Cinco de Mayo! Suzie suggests a margarita with this, too - of course! !